Hacking the President’s DNA | Werkgroep "George Orwell"
The scenario we’ve just sketched may sound like nothing but science fiction—and, indeed, it does contain a few futuristic leaps. Many members of the scientific community would say our time line is too fast. But consider that since the beginning of this century, rapidly accelerating technology has shown a distinct tendency to turn the impossible into the everyday in no time at all. Last year, IBM’s Watson, an artificial intelligence, understood natural language well enough to whip the human champion Ken Jennings onJeopardy. As we write this, soldiers with bionic limbs are returning to active duty, and autonomous cars are driving down our streets. Yet most of these advances are small in comparison with the great leap forward currently under way in the biosciences—a leap with consequences we’ve only begun to imagine. Of course, heads of state would not be the only ones vulnerable to synbio threats. Al‑Qaeda flew planes into buildings to cripple Wall Street, but imagine the damage an attack targeting the CEOs of a number ofFortune 500 companies could do to the world economy. Forget kidnapping rich foreign nationals for ransom; kidnapping their DNA might one day be enough. Celebrities will face a new kind of stalker. As home-brew biology matures, these technologies could end up being used to “settle” all sorts of disputes, even those of the domestic variety. Without question, we are near the dawn of a brave new world. 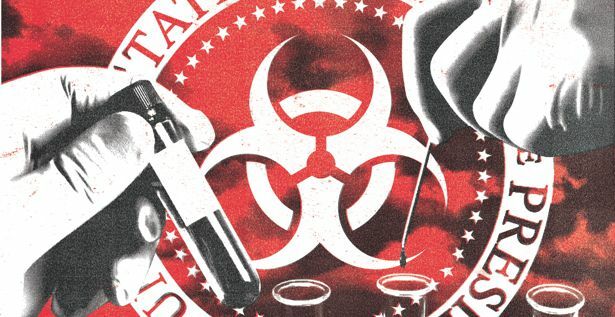 How might we protect the president in the years ahead, as biotech continues to advance? Despite the acceleration of readily exploitable biotechnology, the Secret Service is not powerless. Steps can be taken to limit risks. The agency would not reveal what defenses are already in place, but establishing a crack scientific task force within the agency to monitor, forecast, and evaluate new biotechnological risks would be an obvious place to start. Deploying sensing technologies is another possibility. Already, bio-detectors have been built that can sense known pathogens in less than three minutes. These can get better—a lotbetter—but even so, they might be limited in their effectiveness. Because synbio opens the door to new, finely targeted pathogens, we’d need to detect that which we’ve never seen before. In this, however, the Secret Service has a big advantage over the Centers for Disease Control and Prevention or the World Health Organization: its principal responsibility is the protection of one specific person. Bio-sensing technologies could be developed around the president’s actual genome. We could use his living cells to build an early-warning system with molecular accuracy.